The district was blindsided by the lawsuit. The National Audubon Society, which is a non-profit organization that aims to fight for the conservation of the environment (“Audubon”, 2016) along with the California Waterfowl Association, sued the Humboldt Bay Harbor, Recreation and Conservation District (Kraft 2017). Humboldt Bay is an important stop for migratory birds to eat and rest on the Pacific Flyway, the path of migration for many birds (Simms, 2017).The Audubon society was outraged by the unjust approval for the expansion of a commercial oyster farm (owned by Coast Seafoods and Co) into the Humboldt Bay Harbor that would hurt Canada geese, Western sandpipers, and other migratory birds (Kraft, 2017). The Audubon society claimed that a faulty environmental report was used by the Conservation District to approve the expansion, and that 200 species of birds, 300 species of invertebrates, and over 100 plant species, including eelgrass, would be affected by this expansion (Kraft, 2017). Why does a decline of a 100 small plant species, like eelgrass, matter? Eelgrass supports a multitude of marine organisms and communities, including but not limited to: crabs, sea turtles, young herring, and other microorganisms through acting as food and shelter. With the expansion of aquaculture as a business, about half of the bay would incorporate wire-like structures (Kraft, 2017). Certain methods to harvest oysters trample eelgrass in the process, which for a species already in extensive decline on the west coast, could have detrimental impacts on the ecosystem as a whole (Kraft, 2017). The spokesperson for the Audubon society, Mike Lynes, points to the fact that with a decline of eelgrass comes a decline of certain birds like the black brant and a decline in certain fish as well (Kraft, 2017). Any decline in a resident species in a habitat will affect the food chain and natural flow of the ecosystem. As if not already expected, the general manager of Coast Seafoods denied that the environmental report was faulty and insisted that the proper measures were taken to evaluate the environmental impact the expansion would have on the Humboldt Bay Harbor (Kraft, 2017). Due to the risk of negative alterations to the seagrass life cycle by oyster aquaculture, the size and number of oyster aquaculture farms must be limited in location and method of farming. Oyster aquaculture specifically is expanding as the result of the increased use of oysters in the culinary industry. With the exponential growth of any industry comes the need to evaluate the effect of the industry on existing infrastructure. In this case, the existing infrastructure is marine biomes, and the new industry is oyster aquaculture. This is a growing industry for good reason. The benefits associated with oyster aquaculture are often discussed amongst scientists and it has been indicated that, if under the right conditions, oysters add positively to the environment. Oysters filter the water around them through a process called denitrification, which is removing nitrogen from the environment (Ward 2016). It is argued that oysters make the water cleaner that they inhabit through their filter feeding methods (Ward 2016). One oyster can filter more than 50 gallons of water in 24 hours. A reef like structure can usually develop as generations of oysters accumulate on top of one another, forming a suitable home for many fish species and crab species. However, these “benefits” can be outweighed by negatives, if clearing the water involves destruction of such species as eelgrass. Aquaculture is also a new industry in comparison to other common forms of farming and has thrived in the past couple decades. Is has expanded greatly, especially in North America and has created jobs all over the continent. In Nova Scotia alone since the establishment of the aquaculture industry, it has grown and contributed largely to the economy (Scotia 2014). This aquaculture boom has created a market “worth more than $60 million in 2014 and directly employed 606 men and women in full- and part-time positions. At present, there are 44 companies actively farming fish at more than 270 sites in Nova Scotia” (Scotia 2014 para. 2). Even with government proposed regulations the ocean has such a vastness of open space for aquaculture, that as of now it doesn’t largely affect the overall population. Aquaculture provides the world with about 30% of the seafood eaten around the world (Maine 2014). Aquaculture doesn’t just provide fishing jobs but also employment in areas such as: processing plants, offices, labs, feed mills, net and cage building, maintenance, supply and service areas (Scotia 2014). It is also becoming a common form of employment for young people in coastal areas looking to start their own business. This makes it easier for the fisherman and communities to work together to create sustainable farms in the interests of the people. Job creation and increase in GDP are just some of the positive contributions aquaculture can provide. In Canada alone, aquaculture contributed over $1 billion to the country’s GDP in 2010 (Canada 2012). Creating over 5,800 full times jobs and many more part time. As long as farmers and the government work together the economy will only benefit from well-managed fish farming and aquaculture. After many years of poor regulation and overfishing of natural fish stocks, aquaculture is the only way to keep up with demand without further destroying the world’s oceans. Conventional wisdom holds that traditional fisheries are producing near their maximum capacity and that future increases in seafood production must come largely from aquaculture (NOAA 2017). This means that aquaculture is necessary to keep the economic impact of seafood alive and help the environment by reducing the needed natural capacity of the ocean. In comparison to natural fishing, aquaculture ensures that seafood is safe for consumption. Growing in captivity makes is easier for producers to limit stock exposures to things such as disease and pollution unlike natural fish. Sea turtles in the United States are listed on the Endangered Species Act (ESA) (“Sea Turtles,” 2016). Although it is difficult to make an estimate about the total population of sea turtles left in the world, because male sea turtles don’t come to shore, the consensus is that there is general decline in the total population of sea turtles (“Habitat & Distribution,” 2017). The loggerhead is the only turtle in the world that is not endangered, but it is threatened (“Sea Turtles Threats,” 2015). As few as 1 in 1,000 sea turtles actually make it to adulthood (“Marine Turtles,” 2017). Sea turtles are negatively affected by a myriad of different human activities, ranging from the illegal sea turtle shell trade to habitat degradation (“Sea Turtles Threats,” 2015). Some sea turtles can be carnivorous, but mainly they are herbivores, eating algae, seagrass, and seaweeds (“Sea Turtle Diet,” 2017). That said, it is important that we maintain the habitat and food source for the dwindling number of sea turtles that are left in the world. A primary problem facing eelgrass is aquaculture, and more specifically oyster aquaculture. Due to the risk of negative alterations to the seagrass life cycle by oyster aquaculture, the size and number of oyster aquaculture farms should be regulated further and reduced in areas of critical seagrass decline. Aside from eelgrass’ importance in sea turtles’ and other marine organisms’ life cycles, this species of plant also plays a much larger role in the ecosystem as a whole. Eelgrass has been known as the foundation of the marine food chain. (“The Importance,” 2014). Eelgrass provides a surface for eggs for spawning by species such as the Pacific herring and a foraging area with shelter for young fish and invertebrates (“The Importance,” 2014). Beds of eelgrass also stabilize the sediment and reduce the force of waves, which in turn slows erosion. Eelgrass can work as a filtration system as well for product runoff (“The Importance,” 2014). Without eelgrass, the species who rely on this will dwindle, and with an endangered species involved, it becomes an irrefutable issue. It is important to note that the main argument for expanding oyster aquaculture is that these shellfish make the water clearer through their filtering mechanisms (Couranz, 2016). Eelgrass also works as a filtration system, so it seems rather unnecessary to try to replace a working filtration system with a man-made, perhaps destructive, oyster aquaculture farm. Eelgrass can also provide a suitable substrate for many invertebrates, crabs, and fish, which is a similar argument in favor for oyster aquaculture expansion (Couranz, 2016). The negative effects of oyster aquaculture on eelgrass and seagrass is seen specifically in the cover and growth of both organisms. Not only do eelgrass and seagrass provide stability to the marine environment oysters grow in, but they also provide habitats essential to other marine organisms as catalogued above (NOAA). The method of oyster aquaculture that was seen to have the greatest effect on eelgrass and seagrass was mechanically harvested oyster beds. In these beds, Dumbauld & McCoy (2015), observed <65% of the mean expected Zostera marina (Z. marina) cover and in general lower eelgrass densities than uncultivated areas (Tallis et al., 2009). When specifically studying the effects of oyster aquaculture on eelgrass, there are very decisive results regarding the negative impact of aquaculture. In the case of eelgrass, the method of collection does not play a part in the decline of above ground biomass. The above ground biomass of eelgrass was found to be 32% lower in aquaculture areas as compared with uncultivated areas (Tallis et al., 2009). 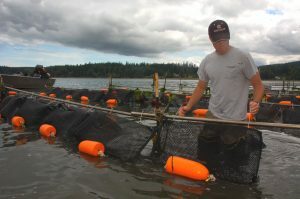 On top of this, the total number of eelgrass plants was 70% lower than uncultivated areas in dredged beds and 30% lower in hand-picked beds (Tallis et al., 2009) again indicating that the method of collection does not change the general negative effects of oyster aquaculture. In addition to the negative effect on density and cover, there is also the simple truth that when species are in the same area they will compete for resources. Competition between oysters and native seagrasses is no exception. Tallis et al. (2015) argue that this fact that species will compete for resources such as space will undoubtedly affect how well each species thrives in that given area. As a result, a large and expanding oyster population will inevitably draw away resources from the seagrass and eelgrass resulting in a decline of those species. One way to combat these negative effects is highlighted by Tallis et al. (2015) when they suggest that the effects of this natural tradeoff between species can be minimized by implementing certain management practices like examining the collection methods and oyster planting density in relation to the eelgrass of interest. The Morro Bay Estuary is an example of an area experiencing a rapid decline in eelgrass population (“California’s eelgrass,” 2016). Morro Bay houses the third largest eelgrass dominated ecosystem in southern California (“Morro Bay”, 2013). What used to be a flourishing area of hundreds of acres of eelgrass has dwindled to fewer than 15 acres (“California’s eelgrass,” 2016). Eelgrass in Morro Bay declined by 94% between the years of 2010 and 2013 (“Morro Bay”, 2013, pg 41 ). A single, concrete reason for the decline cannot be determined, but rather a combination of indirect factors caused this extreme decline (“Morro Bay”, 2013). Factors include deadly biological pathogens that have perhaps been brought into the water by nutrient loading, changing of water quality, changing elevations, and changing climates (“Morro Bay”, 2013). It is apparent that seagrass is in decline, and since there are many indirect factors that lead to the decrease in grasses, it is pertinent to not put more pressure on the seagrass. The Morro Bay Estuary is just one area experiencing this decline, which is why it has been proposed that oyster aquaculture sites not be enacted in areas such as these and restricted to areas that can maintain stability even with the invasion of an oyster farm. There are a variety of techniques used for oyster aquaculture. The two main categories include on bottom and off bottom cultivation (Ahmed & Solomon, 2016). On bottom cultivation is exactly like what it sounds, the oysters are spread across the bottom, in an intertidal zone (Ahmed & Solomon, 2016). This method, while it produces healthier and heartier oysters, is typically avoided by commercial farmers due to the mortality rate of the uncaged and unprotected oysters (Sea Grant 2002). The other category, off bottom cultivation has a variety of different methods including, but not limited to, rack and rail, longline, and floating systems (Sea Grant 2002). While they each possess their own advantages and disadvantages to the farm itself regarding productivity and financial feasibility, they all impact the benthic community. They all impact the seagrass beds, but not all are statistically significant (Ahmed & Solomon, 2016). Some are less environmentally destructive than others. While both varieties of methods, dredged and off bottom, contribute to eelgrass decline, the off bottom method is the better of the two. The direct competition between the oysters and the eelgrass for space on the seafloor is the major issue with the dredged method. This is not the only issue, the human activity involved in harvesting and upkeep effect the eelgrass as well. Due to it being highly sensitive to interference such as vehicle wheels or foot traffic. The off bottom method may cause population or density decline due to shading, but it does not directly take away from the area in which it grows. The rack and rail method (an off bottom method) is typically conducted in an intertidal zone, where mesh bags used to hold the oysters are placed on and tied to an elevated metal rack so that the oysters do not touch the ground. (Sea Grant 2002). One study showed that an intertidal rack and rail method adversely affected the health and survival of the surrounding seagrass beds (Madigan, Venema, Haskard, & Clarke, 2000). The equipment and infrastructure used will lead to the seagrass being physically shaded, which results in less light available for the seagrass below to utilize (Ahmed & Solomon, 2016). Seagrass is in a very sensitive ecosystem that does not react well to interference (Ahmed & Solomon, 2016). The impact of human foot traffic, vehicle wheels, or boat propellers cause an observable impact on the seagrass communities (Ahmed & Solomon, 2016). Another study conducted by Bulmer, Kelly, and Jeffs (2012) investigated the effects of another form of off bottom cultivation, hanging baskets, which are similar to the rack and rail method except instead of bags, baskets are hung from the rack (Sea Grant 2002). This method of cultivation leads to a decline in seagrass cover (Bulmer 2012). While it was not a huge decline, there was a decline observed (Bulmer et al., 2012). The longline method involves the clutch of oysters strung on a line and either hung from a dock or suspended on a rack (Sea Grant 2002). One study, investigating the effects of longline harvesting and on bottom dredging, showed that both methods have a negative impact (Tallis et al., 2009). The longline method reduced seagrass areas by 32% and lowered the production per area by 70% (Tallis et al., 2009). While the overall area and productivity decreased, the density of the seagrass did not change. (Tallis et al., 2009). The dredged method however lowered density by 30% and productivity by 70% (Tallis et al., 2009). There was a slight increase in the growth rate observed, but it was not significant (Tallis et al., 2009). Another study conducted earlier by Thorne (1998) showed that floating oyster racks did indeed reduce the seagrass cover, but after long periods of unstocked racks the seagrass was shown to recover (Thorne 1998). In order to combat the harmful management practices, it would be a good idea to combine some of the less destructive methods, and to exclude or ban on bottom dredging which, as aforementioned, is usually avoided already. It is apparent that both methods have an adverse affect on the surrounding benthic community. Longline harvesting is the suggested method that should be implemented. Although there is a 70% decrease in productivity, there are ways to revise the long line method that would be beneficial and potentially economically savvy (Tallis et al., 2009). The longline method is advantageous for the fact that surfaces beneath the ocean that are unsuitable for oyster growth are no longer a useless area and can be utilized through this off-bottom technique (Toba 2002, pg 9). Predation of oysters by starfish and crabs is reduced through this method as is survival, fatness, and growth (Toba, 2002, pg 9). A study in Cedar Island, North Carolina compared longline harvesting to a floating bag system (Styron, 2012). The time to build these structures is an important aspect often overlooked in research, but nonetheless a crucial evaluation point for efficiency approximations. It was found that the total time it took to put together 300 floating bag systems took 50 hours, while putting together 300 longline systems took a total of 7.5 hours (Styron, 2012, pg 15). In addition, the longline harvesting method allows light to reach the environment beneath it, which is a major component in the life cycle of photosynthetic organisms such as eelgrass (“Adjustable longline”, 2017). One state in the US that does especially well is Maine that claims “today, aquaculture is a large part of the marine resource economy, employing over 500 people and generating sales and revenue that is second only to lobsters. Maine’s leading commercial fishery”(Maine, 2003, p. #). Not only is this an impressive number of jobs but, this also happens in a state that imposes some of the strictest aquaculture regulations and monitoring requirements in the world. This is a sign that regulations and proper management is possible and entirely achievable. These regulations and monitoring programs are enforced by both state and federal agencies. In addition to compliance with all regulatory requirements, there are a number of characteristics you can look foras indicators that an aquaculture proposal or operation is being responsibly managed. (Maine 2013). Strict management techniques ensure the ecological impact of aquaculture is minimal and still produce enough profit for farmers. Regulation and profit are both obtainable goals. As long as farms are managed responsibly and away from wild fish stocks, the impact is reduced to a minimum (Worldwide 2014). It isn’t a far-fetched idea to restrict areas to certain fishing activities. Marine protected areas (MPAs) in the high seas already exist and are in place, although enforcement of the rules laid out has taken the back seat (“FAO fisheries,” 2017). The mission of MPAs is to reduce the impact of vulnerable species and habitats. In 2009, the North East Atlantic Fisheries Commission (NEAFC) closed off an area of about 330,000 square feet in an effort to protect coral and juvenile fish that reside on the bottom of the ocean (“FAO fisheries,” 2017). Any type of fishing that may come in contact with the ocean bottom is prohibited. Enforcing MPAs could be the saving grace for ecosystems such as that of the native eelgrass. Regional and international monitoring control surveillance (MCS) systems are starting to be developed in an effort to enforce that restricted areas be left alone and free of human intervention (“FAO fisheries,” 2017). It is possible to extend these regulations to oyster aquaculture and to restrict any new intervention of the sort in areas of rapid eelgrass decline. With the demand for seafood and the aquaculture business exponentially expanding, the importance of preservation of the natural environment cannot be ignored. Eelgrass will continue to decline if oyster aquaculture expands into environments that cannot sustain the inference of another species. Oyster aquaculture has its benefits through filter feeding and stabilization of sediment, but the risk of disruption to the food chain through the loss of eelgrass is too problematic to be ignored. Through the incorporation of more environmentally conscious management practices (mainly longline harvesting) and the use of marine protected areas, a solution to the competition for resources can be reached and the decline in eelgrass should be reduced. Thorne, A.J. (1998) Alterations in the structure of macrobenthic communities related to the culture of oysters (Crassostrea gigas). B Sc. (Hons.) Thesis, University of Tasmania.